The uilleann pipes (pronounced "illun"; from the Irish píob uilleann--"elbow pipes") are the most complex and highly-evolved of all bagpipes. Notoriously difficult to play, the oft-cited Irish adage about the pipes is that it takes 21 years to make a piper: seven years learning, seven years practicing, and seven years playing. They are a challenging instrument indeed, but I cannot think of a more beautiful and rewarding instrument to play. 1.) 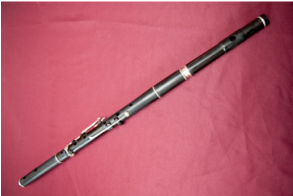 The chanter, which plays the melody, and has a double reed like an oboe. 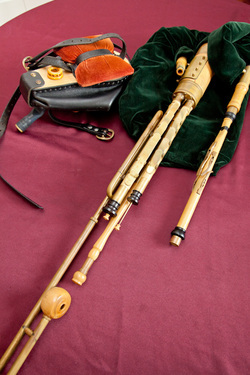 Unlike nearly all other types of bagpipes, the uilleann pipe chanter is capable of a fully-chromatic two octave range. 2.) The drones, which play a sustained note (D). The tenor drone is tuned to the bell note of the chanter, the baritone drone one octave lower, and the bass drone two octaves lower. When properly tuned, the harmonics are incredibly rich. 3.) The regulators, which are keyed chanters placed in the stock above the drones. When played with the piper's wrist or hand, they can produce chords and counter-melody. With so many components working in unison, it is little wonder that a common early name for the uilleann pipes was "the Irish organ." The uilleann pipes are much quieter than Scottish bagpipes and are meant to be played indoors. They have a sweet tone that blends well with fiddle, flute, and other Irish traditional instruments. I am very fortunate to play on an amazing set crafted from boxwood, ebony, and brass by three of the finest contemporary makers, Cillian Ó Bríain, Gordon Galloway, and Michael Hubbert. 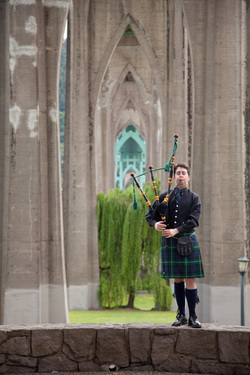 The Scottish Highland bagpipe, or pìob mhór in Gaelic, is the quintessential instrument of the Scottish Gaels. Through its use by Scottish regiments in the British army, it became the most famous member of the bagpipe family. Today, one can find people playing Scottish bagpipes in virtually every corner of the world. While many people are familiar with tunes such as "Amazing Grace" and "Scotland the Brave", the repertoire of the instrument is actually incredibly vast and varied. From thrilling strathspeys, reels, and jigs to the highly complex and plaintive sound of ceòl mór, the art music of Gaeldom, the pipes are capable of immense musical expression. I play a set of R.G. Hardie drones with a Peter Henderson chanter. The Scottish smallpipes were once played across the whole of Scotland. Much quieter than their Highland cousin, they were favored for playing at indoor dances. They had died out by the beginning of the 20th century, but they were resurrected in the early 1980s largely due to the efforts of piper and pipemaker Hamish Moore, who performed and recorded on the instrument and began to make new and improved smallpipes based on 18th century designs. They are now more widely played than ever before. Like the uilleann pipes, the Scottish smallpipes are powered by a bellows strapped to the piper's arm. They have a rich, warm tone that sounds wonderful on its own and blends beautifully with the fiddle. I play a set pitched in A made from ebony, cocobolo, and silver by Hamish Moore of Dunkeld, Scotland. The wooden concert flute was once the mainstay of the European symphony orchestra, and a popular instrument among the landed gentry in many countries--notably Ireland. In the 1850s, these instruments began to be abandoned in favor of Theobald Boehm's radically redesigned silver flute. As the old flutes got tossed out, they found their way into the hands of the hired help who quickly discovered that the instrument was ideal for playing Irish dance music. It has been used in Irish traditional music ever since. While some players still use old 19th century originals, many fine makers are now making improved, modern versions of the instrument. I currently play an excellent flute by Stéphane Morvan, a master flutemaker from Brittany.